As many of you already know I love eBay. I also love when I can contain myself and have some patience to wait for cards to drop in price to buy them. 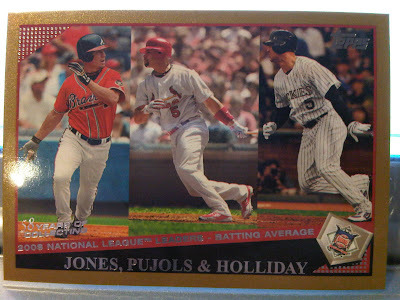 I need this last card to complete my Topps for 2009 (I'm not chasing the black /58), and I won it for 99 cents. The same seller also had another card I needed, and the shipping was combined for I think $1.50 or so. You can't beat that for shipping on eBay. That's one thing that is good and bad to do on there. I always check when adding a card to my watch list to see if the same seller has other cards that I need this way I only pay for shipping once. It's bad because you tend to buy more than you planned on. Last night I picked up a few steals, some had free shipping which makes me smile. I will save those for a later release but all the Pujols collectors that were sleeping last night, I thank you very much. Anyone pick up anything good on eBay lately? It seems as though I have better luck when I don't care about paying attention to the things I want. If I bid one price and then tell myself that there is no more bidding I seem to win. Going to the Yankee game on Friday and Sunday, I sold my tickets for tomorrow so maybe I should go Target hunting tomorrow... Can someone ask the Target people to get in some more 2009 products? Maybe if we all promise to buy them, they will start sending them. I've noticed a few oddities on eBay lately as far as my PC goes. I have been for quite a while collecting all of the 2005 Absolute auto/gu/parallels of Andre Dawson and Billy Williams. On the same night that I get outbid for a Dawson auto /75 that eventually sold for $26, I picked up a Billy Williams auto /25 for $9!! 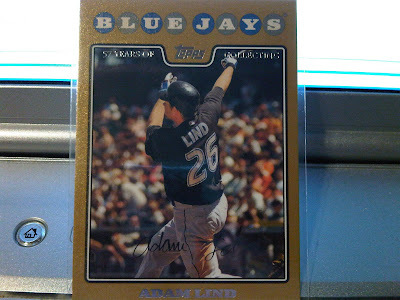 Yes, Lind is an 08. I <3 08 Topps.